Do Kahneman–Tversky results hold for longer periods and aggregate behavior? They show that humans dislike losses "more" than they like comparable nominal gains. The results come from a series of brief experiments. Can these results be valid in the following situations? A loss or gain is a one-time event, but the impact (negative or positive disutility) persists and affects decisions over days, weeks? 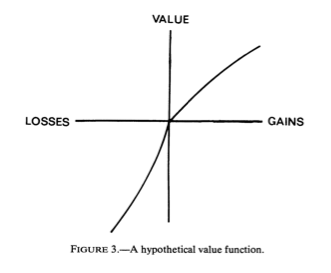 Losses or gains across multiple individuals lead to a decrease or increase in (hypothetical) aggregate utility, without cancelling each other. That is, if workers become unemployed in a recession, can we apply the Kahneman–Tversky framework to explain, say, their likely protests (and it's not enough to restore their incomes because the loss is overweighted)? Or from the point of psychology, a wage loss looks differently? To clarify the latter, a wage loss leads to a series of negative events, each of which has a negative impact. But does this chain still yield the effect similar to the depicted one, as we sum up the impacts? Alternatively, how often does the reference point tend to refresh itself, so that we could treat the next event as happening at (0, 0) in the plot and not just as an add on to the previous event? The framework is not so literal, anyway; but maybe the question still makes sense at the given level of abstraction. Kahneman, Daniel, and Amos Tversky. “Prospect Theory: An Analysis of Decision under Risk.” Econometrica 47, no. 2 (March 1, 1979): 263–91. doi:10.2307/1914185. Browse other questions tagged social-psychology economics behavioral-economics or ask your own question. Would the Milgram Experiment results be replicated in Eastern cultures? Research on gift structure and satisfaction: one large gift or two small ones? Using Cognitive biases for behavior change? are statistic results of these two questions equal? What is the relationship between a strong work ethic and an honest reputation and individual success? Why some papers suggest that losses and gains are coded by the same mechanism while other suggest that distinct circuits anticipate gain and loss?